Jay-Z and Beyonce normally give folks a front row seat to a sick performance, but they switched it up Saturday after their Rose Bowl concert and became spectators themselves. Jay & Bey were seen at an after-party thrown on the heels of their show in Pasadena, where they sold out the Rose Bowl for night 1 of 2 of their last couple performances in L.A. Their 'On The Run II' summer tour wraps in Seattle next week. During the shindig, two break dancers were putting on their best moves in front the couple ... and they did not disappoint. Check out Beyonce's reaction -- she's definitely into it. Never hurts to impress Queen Bey ... we know she could always use more dancers. 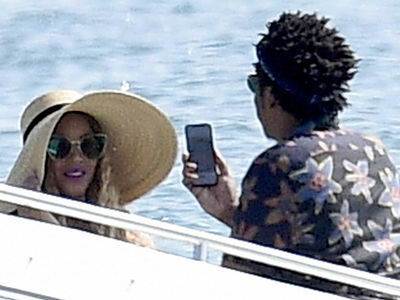 It's a nice change of pace for Jay and Bey, who've been putting quite a run together for some very famous audience members these last few months. Some A-listers who've enjoyed their OTR II tour ... Dez Bryant and Jerry Jones, Justin Verlander and Kate Upton ... and, of course, the Obamas. It's like Jay once said ... after the show, it's the after-party ... where we'll take in a show and break dancers are gnarly. That's how that goes, right?